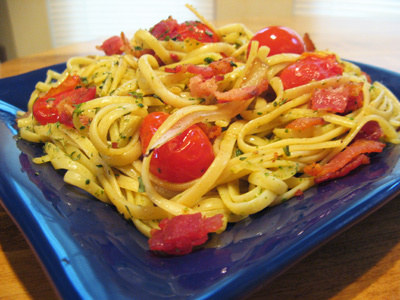 Have you ever paired BLT with pasta? If you haven’t yet, then you’ve got to try this pasta. This is my go to pasta when I need a pick me up and one of our favorite comfort foods. 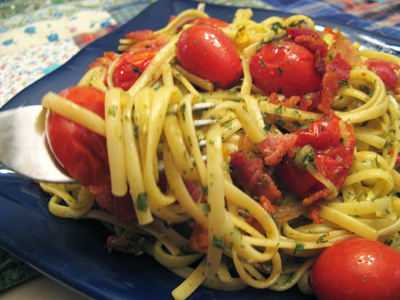 There are different versions of BLT Pasta but I like the combination of crisp bacon, roasted tomatoes and pesto. I used fettuccine because I had it on hand, but another pasta would work just as well. For the 1 box of pasta I added 6 slices of bacon, 2 cups of cherry tomatoes, spinach or arugula pesto, 1/2 onion, parmesan cheese, balsamic vinegar and olive oil, plus salt and pepper. I always have pesto on hand and for this I used arugula pesto. 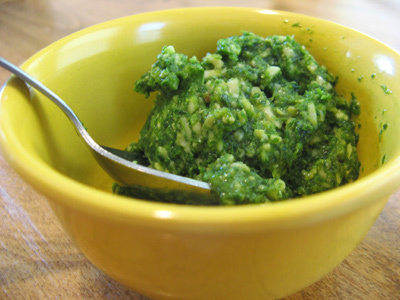 If you want to make pesto here’s the links to for Arugula Pesto and Spinach Pesto. Place the cherry tomatoes and onion slices on an aluminum lined cookie sheet. 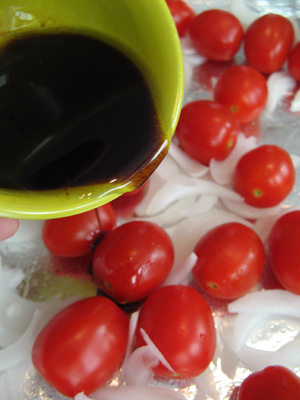 Whisk together 2 tablespoons balsamic vinegar and 2 tablespoons olive oil and pour over the tomatoes and onions. Salt and pepper the tomatoes and onions. Place in a 400 degree oven for 10 minutes. After 10 minutes the tomatoes will be soft and wrinkly almost to bursting. 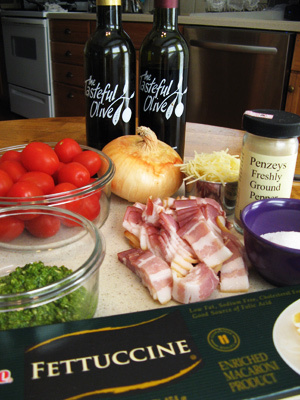 The balsamic mix will flavor the tomatoes and onions and give the pasta an added tangy flavor. 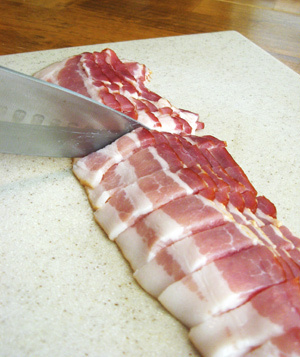 While the tomatoes are roasting, slice the bacon into 1/2 inch slices. 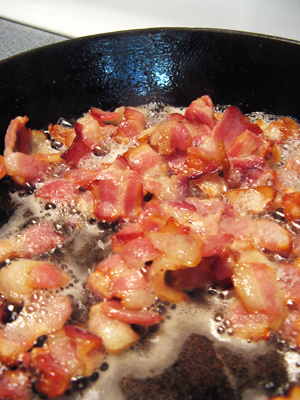 Cook the bacon in a skillet over medium high heat. I like to give it a stir with a wooden spoon and the bacon pieces will separate and cook evenly into crisp little bite size pieces. Once they are cooked remove the bacon pieces to a plate lined with a paper towel. Cook the pasta according to the package directions. If using fettuccini it will take about 12 minutes. 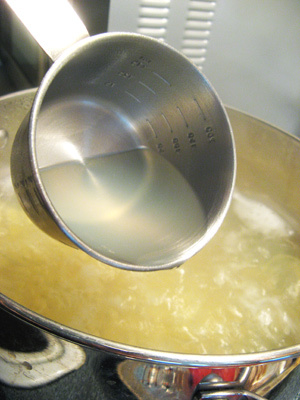 When the pasta is cooked, hold out a 1/2 cup or so of pasta water before draining. Once your pasta is cooked and drained, add everything to a large bowl. 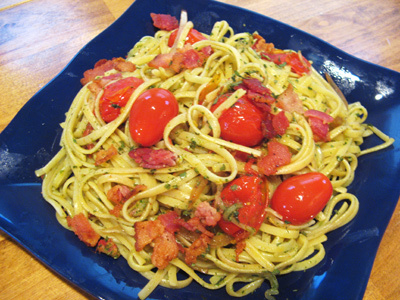 Using tongs, gently toss the pesto, tomatoes, onions, bacon and parmesan cheese in with the pasta. If the pesto cheese mix starts to stick and clump, just add a bit of pasta water. Make sure to get a bite of everything. The flavors of pesto, bacon and tomatoes bursting in your mouth is oh so good. Preheat oven to 400 degrees. 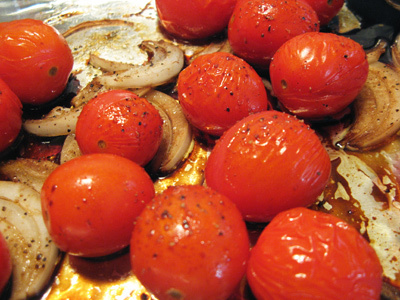 Place cherry tomatoes and sliced onions on a cookie sheet lined with aluminum foil. 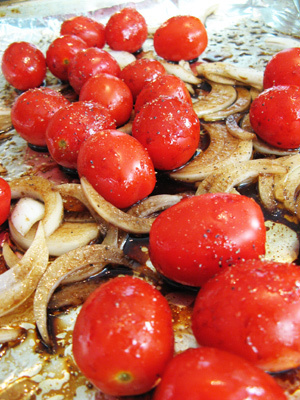 Whisk together the balsamic vinegar and olive oil and pour over the tomatoes and onions; sprinkle with salt and pepper. Roast in 400 degree oven for 10 minutes until tomatoes are just about bursting. 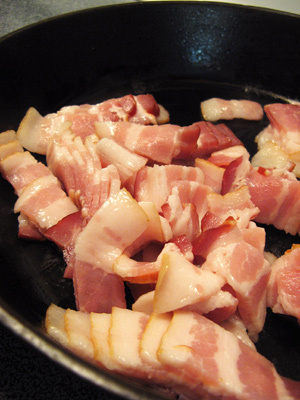 Cook bacon pieces in a skillet over medium high heat stirring often. Cook until pieces are crisp, remove from skillet and transfer to a plate lined with a paper towel. Prepare pasta according to package directions. 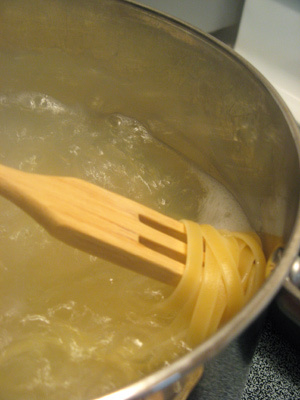 Save out 1/2 cup of pasta water before draining pasta. 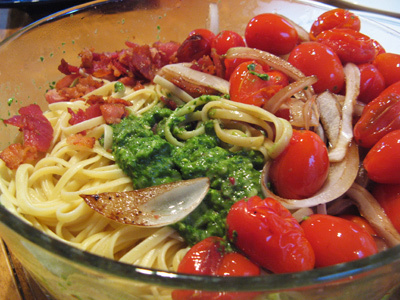 In a large bowl, add pasta, bacon, tomatoes and onions, pesto, and parmesan cheese. Gently toss the pasta to incorporate all the ingredients. Salt and pepper to taste. Note** If the pesto and cheese clumps while tossing the ingredients into the pasta, add a little warm pasta water to help loosen it.